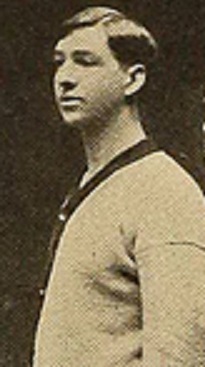 Ben “Bunny” Elliott was an outstanding football and basketball player during his two years at the University of Pittsburgh. Elliott was coached on the basketball court by early pro star, Harry Hough, who moonlighted from his staring role with the South Side Central Basketball League team team to coach the University squad. Because of his size, Elliott was a valuable college player, but he met with little success in the CBL and was released early in his second pro season. Samuel Benjamin Elliott Born: Aug 3, 1883 Died: Jun 28, 1958 Hometown: Mercer, Pa.